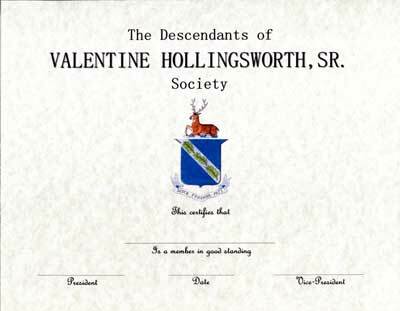 The Descendants of Valentine Hollingsworth Sr. Society (DVHSS) welcomes all descendants and interested researchers of the Hollingsworth, Hollandsworth, Hollingworth, Ree, Calvert, Conoway, Malin, Atkinson, Robinson, Cook, Harlan, Heald, Thompson, Tyler, Rodgers (Rogers) and related lines during the 1575 - present periods within England, Northern Ireland and Colonial (later PA, DE, MD, VA) developments. Any person who is interested in researching and exchanging documented evidence supporting their Hollingsworth and related surname lines are invited and strongly encouraged to join in support of our objectives. Members will receive the certificate of membership shown above upon acceptance into the Society. Members receive copies of the Society's quarterly publication, Hollingsworth Heritage and full access to the members area of this website, which includes access to our family tree databases, Military History Project, DNA Testing Program History, and all prior issues of the Hollingsworth Heritage. In addition, members may vote in the annual business meeting, held during our yearly reunion. Information on our databases and a sample of the Hollingsworth Heritage are located in the related sections of this website. For further information on membership, please access the Contact Us section of the website.